The Battery Grip for EOS 6D Mark II from Vello is a dedicated power supply that can hold up to two LP-E6 or LP-E6N Li-ion batteries, which doubles the camera's shooting time. Before attaching the rubber non-slip grip, the battery chamber cover of the camera can be safely stored away within the battery grip. Allowing easy access to the vertical shutter release, AF area, AF point selector, AF start, AE lock, and main dial, the grip allows you to control the camera when you're shooting vertically. The on/off switch prevents accidental firing of the camera or any other changes that can occur when the vertical controls are not in use. When the grip is in the off position, it deactivates all the controls, but the batteries still supply power to the camera, and a hand strap mount is located on the bottom and compatible with the HGS-2 and HGS-3 Hand Grip Straps. The 1/4"-20 threaded mounting socket makes it possible to attach the camera to a tripod. 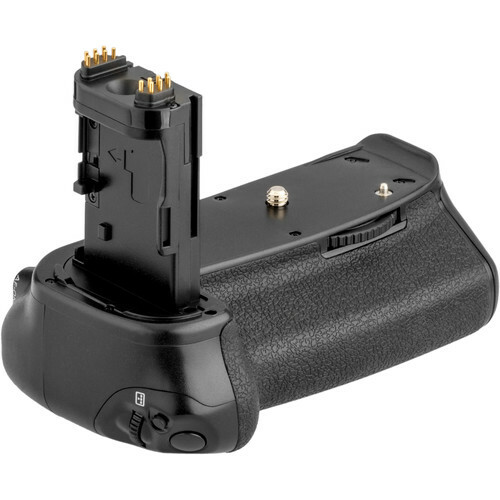 Box Dimensions (LxWxH) 6.4 x 5.1 x 3.7"
Battery Grip for EOS 6D Mark II is rated 5.0 out of 5 by 4. Rated 5 out of 5 by Robert from Tough to Tell the Difference This grip has all the bells and whistles of the Camera manufacturers pricey model at almost one third the cost. Everything fits well and the extended camera buttons and controls work great! I am very pleased! Rated 5 out of 5 by Raymond from Excellent product Feels just like a genuine Canon product and works perfectly. will it work wth 6D? No, it is only for the Canon 6D II. How does it compare to the canon battery grip? Have all the same things ... i get one for me! Get one for you! Answered by: Carlos Henrique L.